Five times Manx Grand Prix winner, Alan 'Bud' Jackson, one of the famous Jackson brothers, has started a campaign to save the 250 TT Race. 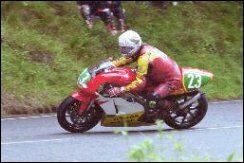 The TT Programme has been changed for 2002, and the 250cc machines will be ran amongst the 600's in the Junior race, with no separate class. Jackson has talked about the matter with Isle of Man Minister for Tourism and Leisure David Cretney, in a bid to reverse the decision. Bud is looking for support with this campaign and would like to hear from anyone who might be able to help. He can be contacted on 01539 726820 or 01524 271778. The loss of a separate race for the 250's is another body blow for two stroke racing in general, which is currently in a state of decline due to high cost's and maintenance, coupled with the lack of new machines coming into the UK.